St James’ Park has been the home of Newcastle United ever since the amalgamation of Newcastle East End and Newcastle West End clubs in 1892. The ground has stood in place however since 1880. Having played host to Magpies fans for over 125 years and standing right in the middle of Newcastle City Centre, the stadium has an old fashioned charmed matched by few in European football and maintains more character than most (especially new) top flight stadia. Having been perfectly symmetrical until this point with a capacity of around 36,000, the construction of second tiers over the Milburn and Leazes Stands was completed in summer 2000 to bring the stadium up to its current capacity. The expansion cost the club £42million but has led to the stadium being used for international football, the Rugby Union World Cup and Rugby League’s ‘Magic Weekend’ more than once. Avoiding the temptation to employ synthetic fibres, groundstaff and directors at Newcastle have consciously decided to keep the integrity of the pitch at SJP buy ensuring only a natural grass surface is uses. This has a solid undersoil heating pipeline and measures the Premier League standard 105 metres by 68 metres for football matches. Although the stadium is only the seventh largest in England in terms of overall capacity, its asymmetrical design means Level 7 of the Leazes and Milburn Stands are the highest in the country. Over 52,300 fans can get into SJP on matchday currently, though plans still allow for a limited amount of expansion up to around the 60,000 mark. The biggest stand at SJP is the Milburn Stand which houses the dressing rooms and directors boxes etc. It is linked to the Leazes Stand by the Leazes West Corner then the Leazes East Corner brings in the East Stand. The Gallowgate Stand or Gallowgate End is joined to the rest of the ground by its own east and west corners. Away fans are housed as far up as level 7 of the Leazes End, in the corner near the giant screen. The standard allocation of 3,000 tickets is usually offered for Premier League games with home fans generally selling out the remainder of the seats. 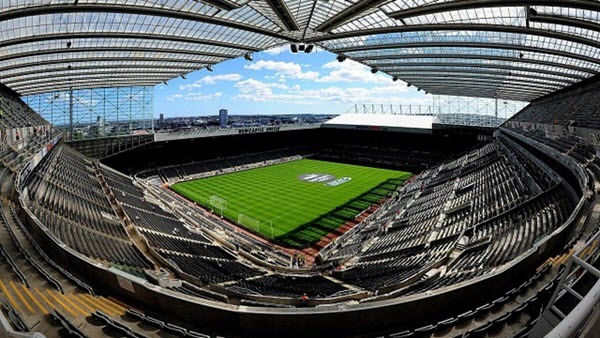 Prices at St James’s Park for a typical home match in the Premier League for general admission run from around £32 – £43 per adult though concessions are of course offered. Guests are invited in to the Joe Harvey Suite, the Sir Bobby Robson Suite, the Heroes Club, the Moncur Suite, the Centenary Club, the Magpie club and many other lounges on matchday with hospitality offers starting from £160 + VAT per person per game. 12-year-olds and under are allowed in at a reduced cost of £80 + VAT. Those from the north and south can use the A1 and those from the west the A69 before linking up with the A167 (Central Motorway) when the stadium will come into view. Follow Barrack Road and then access to the stadium is on your left hand side. With plans in the 90’s for a new stadium on land adjacent to SJP at Leazes Park scrapped, Newcastle’s current home underwent several changes and could yet undergo more. A further tier on the Gallowgate End linking up with the upper tier of the Milburn Stand would bring the capacity up to around 60,000 and is apparently something the owner would have done had England (and Newcastle) won the World Cup 2018 bid.